Male Sparrowhawk first seen perched on garden fence before it flew down to the Bay tree where several house sparrows nest and roost. It was unsuccessful this time and flew off. 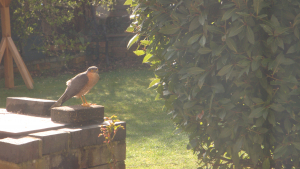 Earlier in the week a female sparrowhawk had been more actively trying to enter the Baytree. Eventually the female caught a mouse from the flowerbed before flying off with it in its beak.